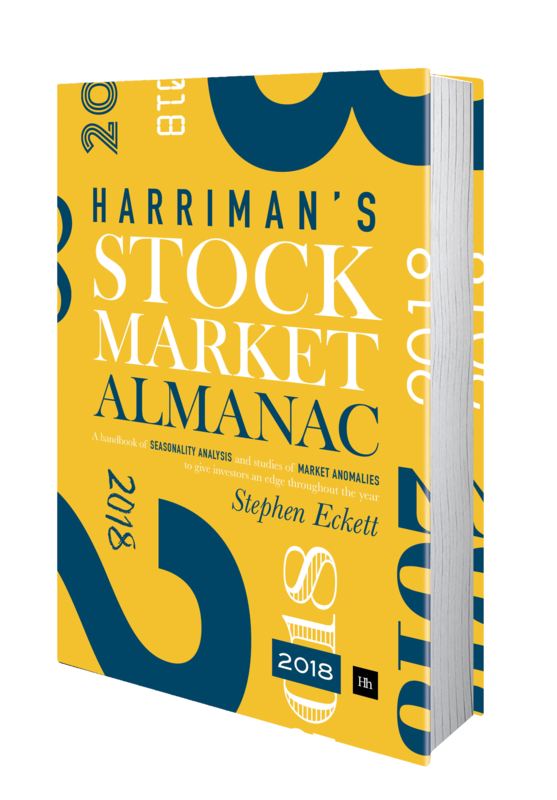 The following charts plot the performance of a selection of world markets in the first quarter 2018. 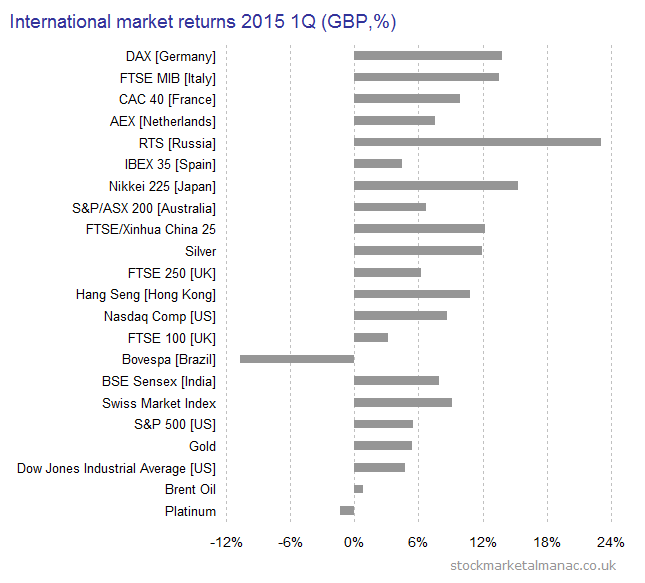 The returns are GBP-adjusted (i.e. these are returns for a GB pound investor). The returns are USD-adjusted (i.e. these are returns for a US dollar investor). 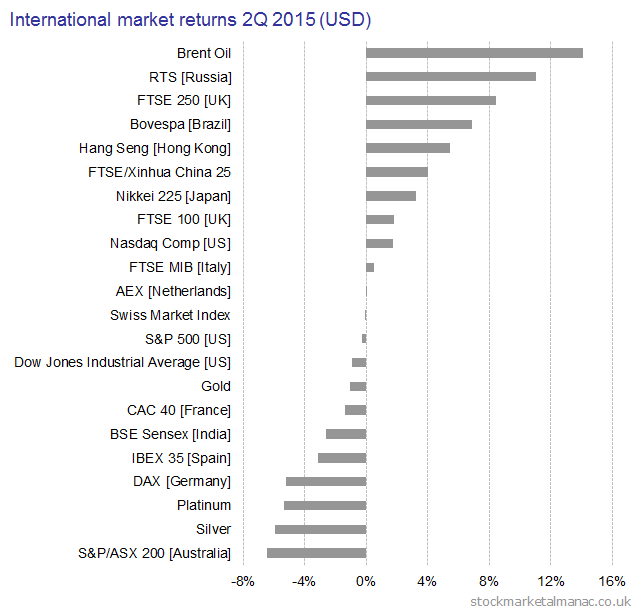 The following chart shows the returns on a range of international stock markets and commodities in the second quarter of 2015. The Euro markets, Germany, Italy, France and Netherlands, after a strong first quarter all saw negative returns in the second quarter. Apart from India, a strong quarter for the BRICs. A weak quarter for metals. Despite falling back steadily in May and June, the strongest performer here was Brent Oil on the back of a very strong April. The following chart shows a sample of currency moves against the British pound in 2Q 2015. For example, the British pound strengthened 5.8% against the US Dollar, and 1.0% against the Russian Ruble. 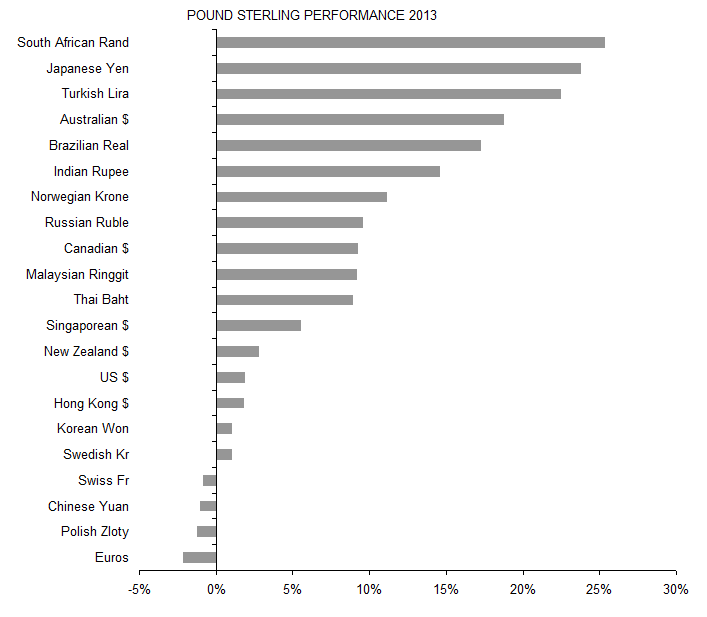 As can be seen, in the last quarter sterling strengthened against all currencies in this sample. 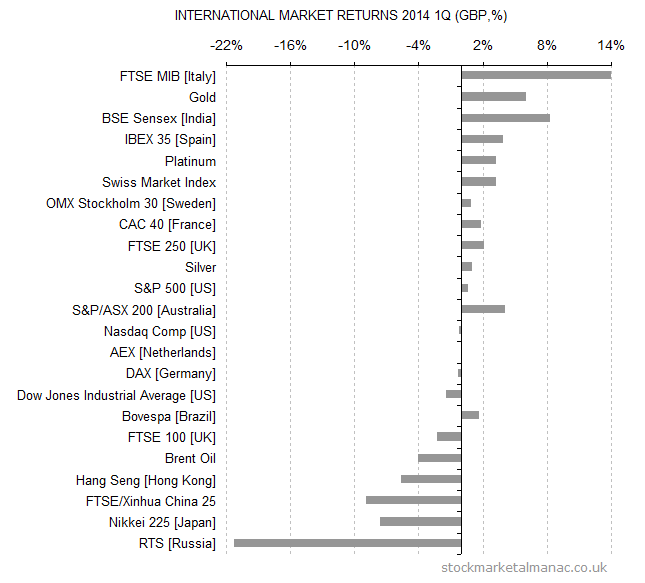 The following chart shows the returns on the same markets as in the first chart, but this time in sterling terms (i.e. 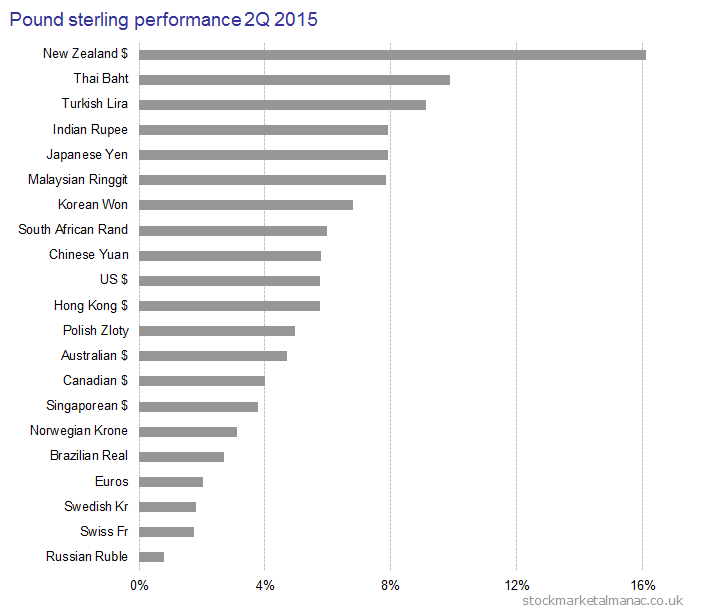 showing the currency-adjusted returns for a UK investor). 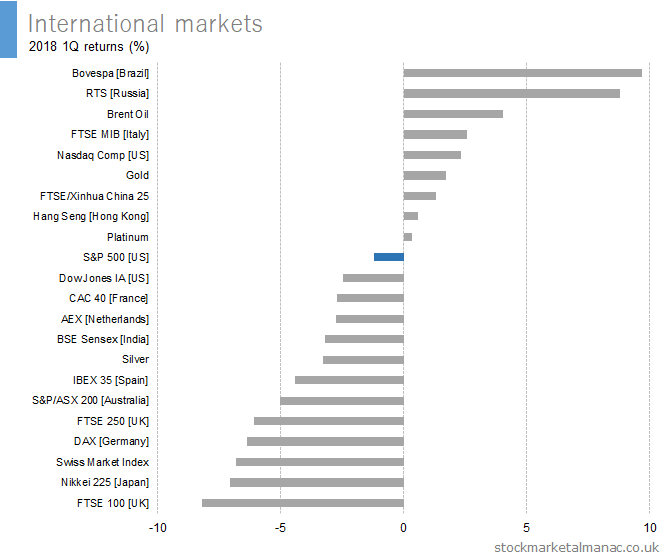 The following chart shows the returns on the same markets as in the first chart, but this time in US dollar terms (i.e. 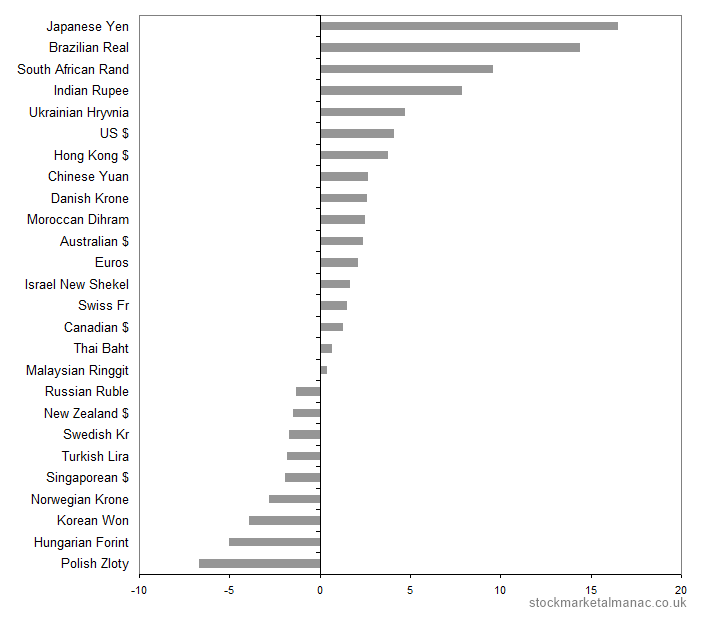 showing the currency-adjusted returns for a US investor). 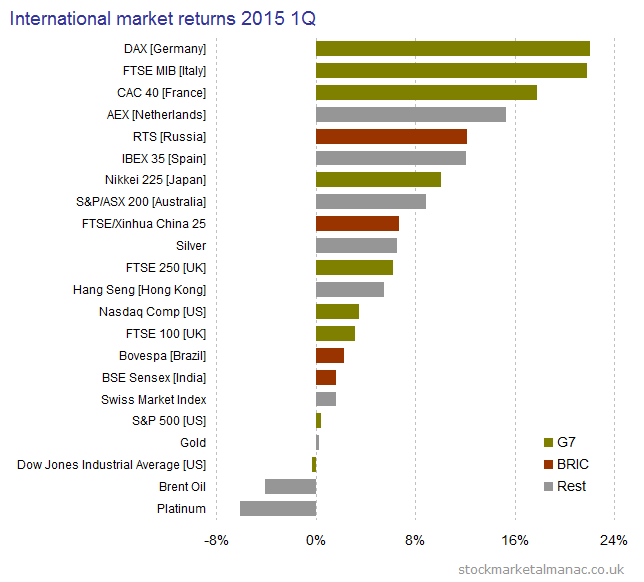 The following chart shows the returns on a range of international stock markets and commodities in the first quarter of 2015. 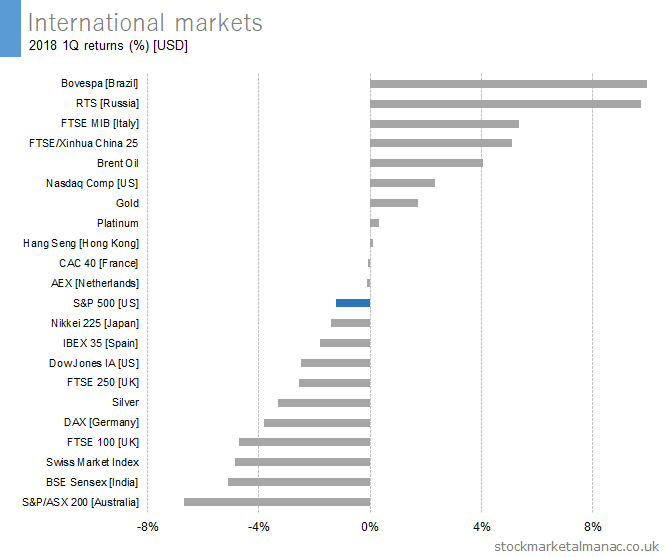 The Euro markets, Germany, Italy, France and Netherlands, dominate the top of the performance chart this last quater. At the bottom are the commodities (gold, oill and platinum), and US stocks. The following chart shows a sample of currency moves against the British pound in 2015 1Q. For example, the British pound strengthened 14.5% against the Brazilean Real, and fell 8.8% against the Russian Ruble. 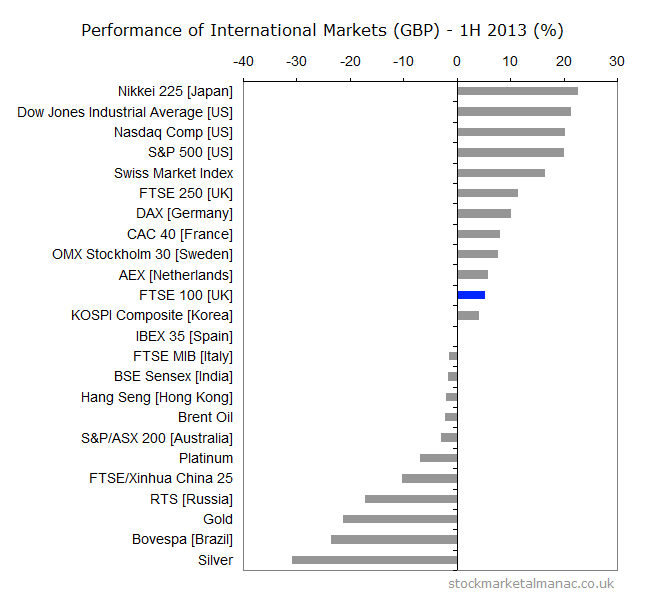 The following chart shows the returns on the same markets as in the first chart, but this time in sterling terms (i.e. 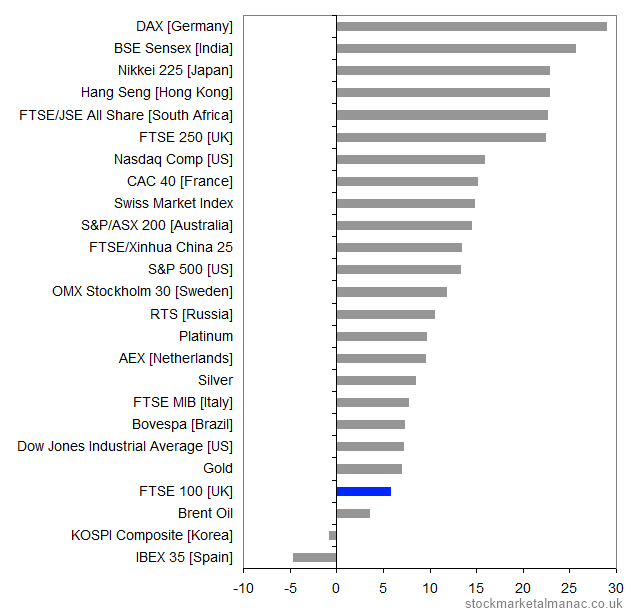 showing the currency-adjusted returns for a UK investor). The order of the markets has been kept the same as in the first chart, to highlight the effect of the currency moves. Over the first quarter sterling strengthened against the Euro (thus diminishing the effective returns from Euro markets), and weakened against the US dollar. A major positive impact for UK investors was the weakness of sterling against the ruble which boosted returns on Russian equity exposure. Conversely, the weakness of the Brazilian Real acted to reduce returns on Brazil equities. 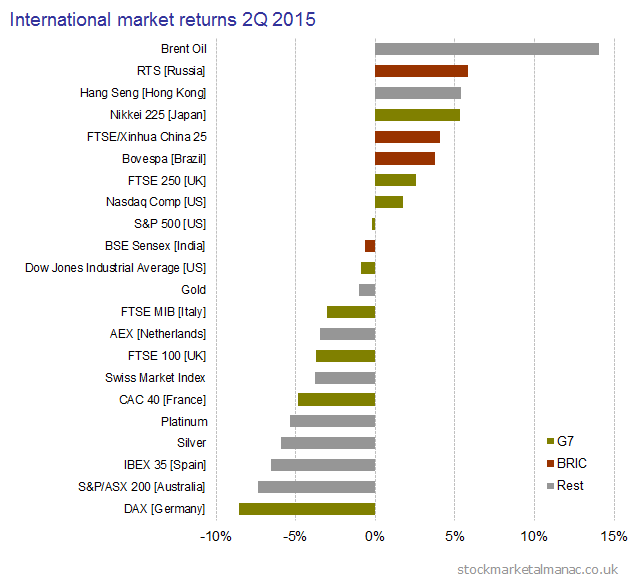 While oil fell 4.0% in dollar terms in the quarter, UK investors saw a small positive return of 0.8%. 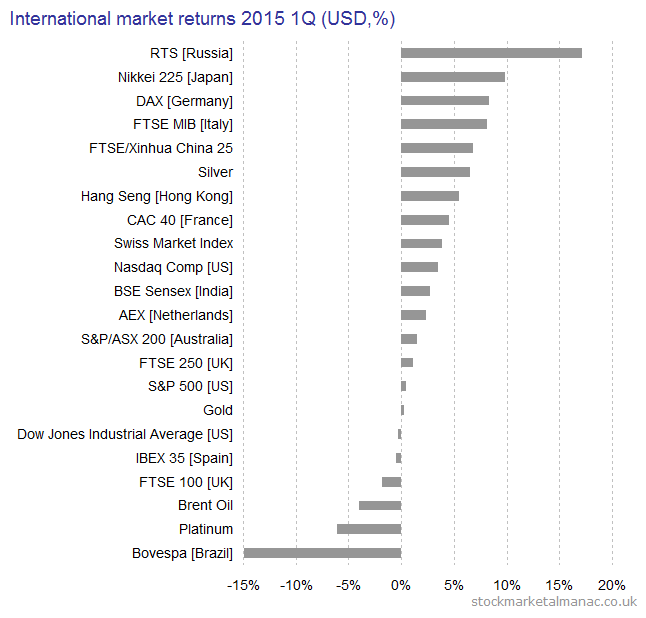 The following chart shows the returns on a range of international stock markets and commodities in the first quarter of 2014. 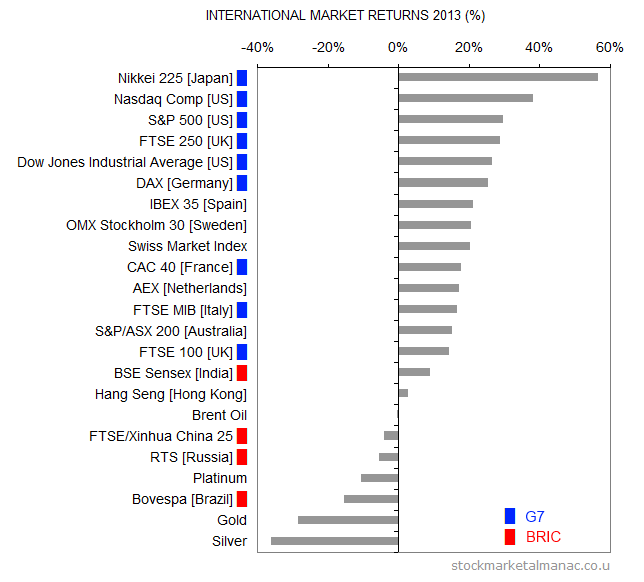 Apart from India, the BRIC’s 2013 weakness continued into the first quarter. 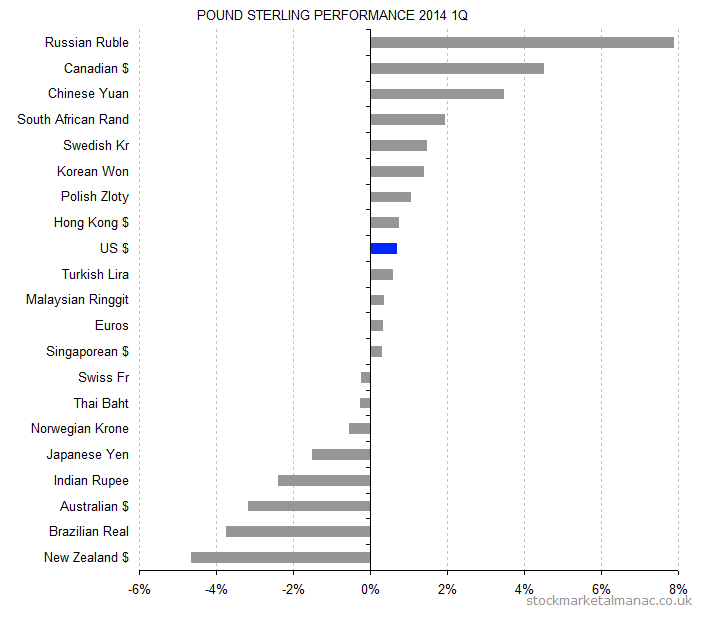 The following chart shows a sample of currency moves against the British pound in 2014 1Q. For example, the British pound strengthened 7.9% against the Russian Ruble, and fell 4.6% against the New Zealand Dollar. 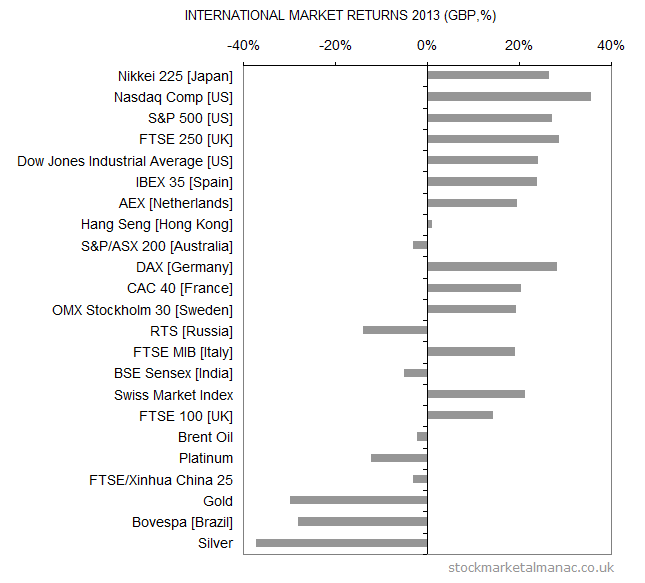 The following chart shows the returns on the same markets as in the first chart, but this time in sterling terms (i.e. 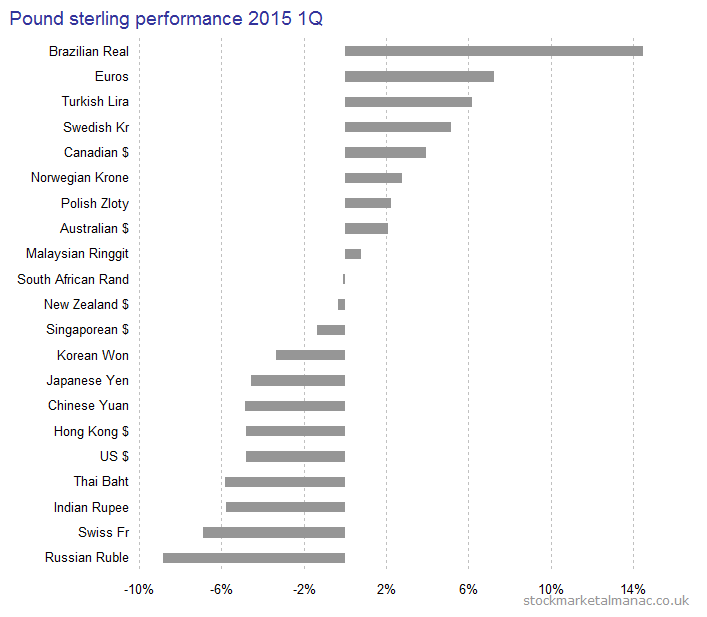 showing the currency-adjusted returns for a UK investor). The order of the markets has been kept the same as in the first chart. As GBP strengthened a small amount against USD and EUR in the period this had the effect of reducing (marginally) the gains in US and Euro denominated markets in sterling terms. Sterling-adjusted, the Indian equity market jumped over gold to be the second strongest market in the period. Although the Brazil equity market fell in the period, sterling investors would have seen a gain due to the weakness of GBP against BRL. 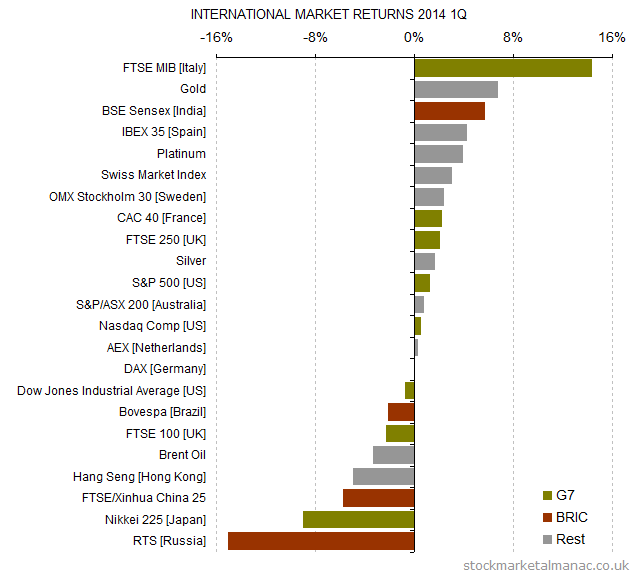 The following chart shows the returns on a range of international stock markets and commodities in 2013. The FTSE 100 was the weakest of the G7 markets here. Not a good year for the BRICS. The following chart shows a sample of currency moves against the British pound in the year. For example, the British pound increased 25.4% against the South African Rand, and fell in value 2.1% against the Euro. 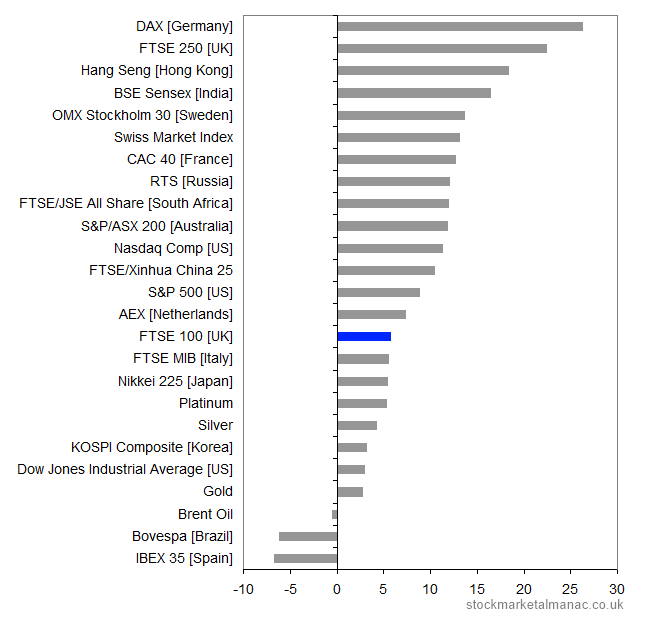 The following chart shows the returns on the same range of markets shown in the first chart, but this time in sterling terms (i.e. 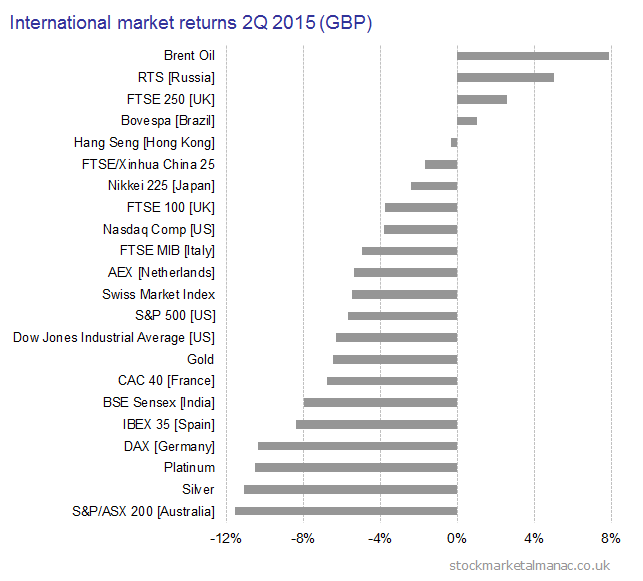 showing the currency-adjusted returns for a UK investor). The order of the markets has been kept the same as in the first chart. UK investors would have seen a return in the Nikkei 225 of 26.6% (down from 56.7% after adjusting for the large fall in the yen against sterling). The strongest sterling-adjusted market in 2013 in this selection was Nasdaq (+35.7%). The second strongest market was the FTSE 250. In domestic currency terms the Australian market rose 15.1% in 2013, but UK investors would have experienced a loss of 3.1% in this market as sterling increased 18.8% against the Aussie dollar. …and the same for gold and silver as sterling appreciated against the US dollar in the year. The following chart shows the performance of a selection of equity and commodity markets for the first six months of 2013. And the following chart plots the same markets but for returns in sterling. 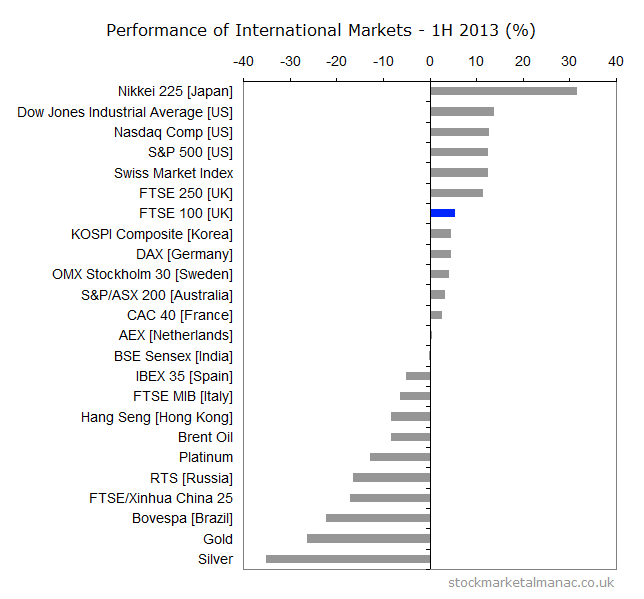 The following chart shows the returns on a range of international stock markets and commodities in 2012. The German market was the strongest (+29.1%), followed by the Asian markets of India, Japan, and Hong Kong. The FTSE 100 was ranked 22 out of the 25 markets appearing here. Over half the markets increased by more than 10% in 2012. The following chart shows a sample of currency moves against the British pound in the year. For example, the British pound increased 16.5% against the Japanese Yen, and fell in value 6.7% against the Polish Zloty. 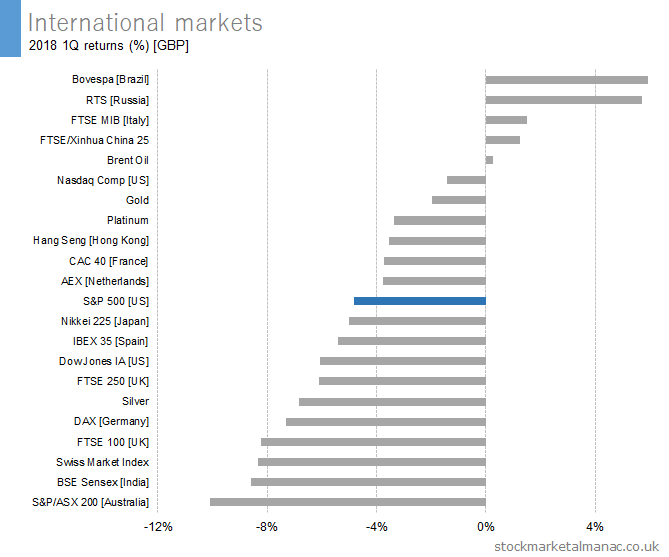 The following chart shows the returns on the same range of markets shown above, but this time in sterling terms (i.e. showing the returns for a UK investor). The German market remains the strongest for 2012, with its returns reduced from 29.1% to 26.4% due to the slight appreciation of GBP against EUR over the year. A big difference is the return for the Nikkei Index in sterling terms – falling from 22.9% to 5.5%. In sterling terms the FTSE 100 climbs from 22nd position to 15th. And in sterling terms the FTSE 250 Index climbs to 2nd position.